As part of its big PAX panel Volition just announced a new Saints Row. 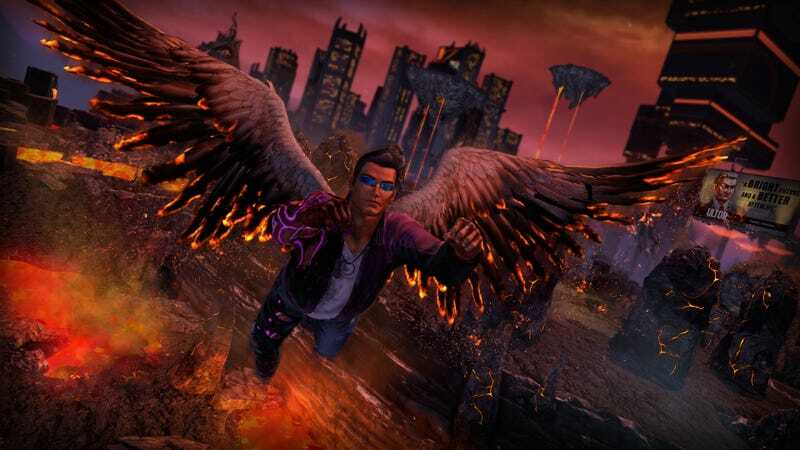 It's called Saints Row: Gat out of Hell, and it'll be out on January 27th. It's a standalone expansion pack for Saints Row IV in which you play as the ever... colorful Johnny Gat or the booksmart yet utterly badass Kinzie—or both in co-op. It's coming to current and last-gen consoles as well as PC and will run you $19.95. Gat out of Hell's main villain? Satan. And Gat? Well, he's gonna shoot Satan in the face to rescue the president. Like you do. According to the PlayStation Blog, Gat out of Hell will take place in the new city of New Hades, which includes areas like "a barren wasteland of an ancient war, a towering downtown for Hell's elite, and a crammed slums built for ultimate suffering." Superpowers are also making a comeback, with a new one—angelic flight—taking center stage. "With angelic wings our Saints will terrorize the ranks of Hell's armies from ankle biting imps to massive Arch-Demons. Super powers are making a return with supernatural twists from demonic summons to deadly holy auras. A new arsenal of wicked weapons can be found as well as The 7 Legendary Deadly Weapons – each the twisted embodiment of one of the 7 deadly sins. Fans may also find some much needed closure for past friends (and enemies)." Spoiler warning: There's apparently a Disney-style musical number in which Satan sings to his daughter about how she should marry the president (aka the character you played) from Saints Row IV. Gat and Kinzie join in, too. Evan says the PAX crowd laughed at it a bunch, which means it maybe has a chance of joining Futurama in the almighty pantheon of funny Satan musicals. We can only hope. In addition, Saints Row IV is making the superpowered 1000 ft leap onto current gen consoles for 30 of your presidentially stamped dollars. That's coming out the same day as Gat out of Hell.